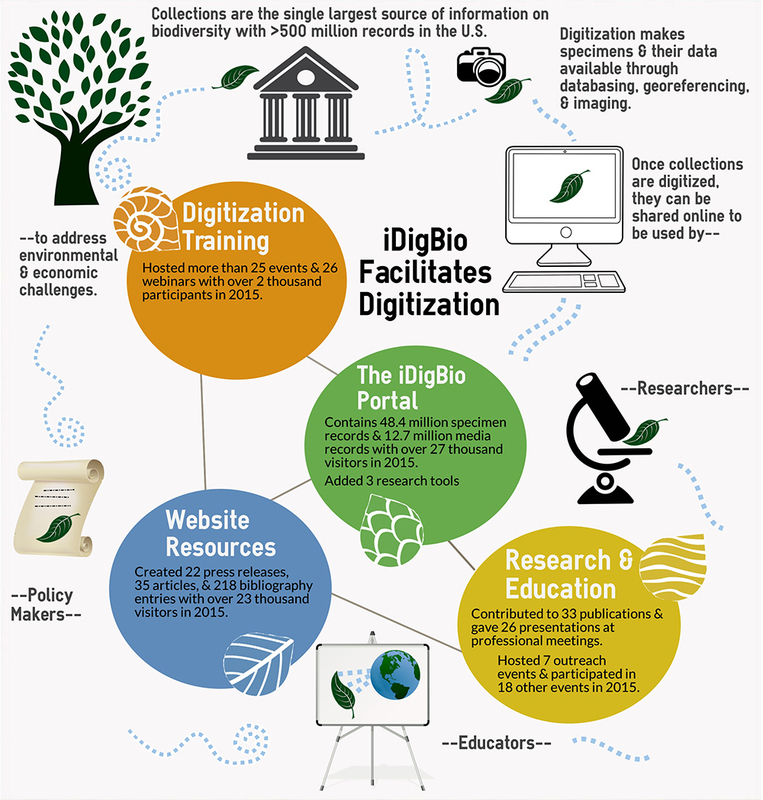 Integrated Digitized Biocollections (iDigBio) is halfway through its fifth year and has many exciting plans for 2016. As we move forward, we will continue to engage the collections community, facilitate digitization and mobilization of data, and enhance the specimen data search portal. iDigBio’s priorities are to work with additional collections to increase digitization and data publishing, increase the use of collections data in research and education, and work on the long-term sustainability of the network. As 2015 comes to an end, we look back on what we have accomplished and highlight the resources available through iDigBio. The Portal has over 48 million specimen records and 13 million media records and is continually growing. iDigBio’s IT team created a new look for the portal and introduced new features in July 2015. The goals of the new design were to facilitate searches by enabling the portal to immediately react to parameters entered by the user and to make the mapping tool more prominent while compacting the area for specifying search criteria. New capabilities include circle- or rectangle-boundary drawing on the map to restrict searches to a geographical region, the option to download the map as an image, and customize the number and display of columns in the list view of search results. Also new to the portal is a sortable, searchable list of U.S. collections and improved discoverability via data quality flags that identify and correct known issues such as missing data, factually incorrect data, or data that are out of compliance with metadata standards and/or controlled vocabularies. Visit the portal and provide feedback on the new look and features. If you are new to the portal, we encourage you to read through the portal tutorial. In 2015, iDigBio held more than 25 events with over 800 participants from 244 institutions. In addition to physical events, iDigBio hosted 26 webinars (virtual events) on a broad range of digitization topics. iDigBio meticulously documents presentations, recordings, and other products from all iDigBio events on the Wiki and in the Bibliography, ensuring that the shared knowledge and accomplishments from these events become permanent resources for the collections community. Moving forward, iDigBio will continue to host digitization training workshops and webinars, but will focus more on hosting events that facilitate using collections data for research and outreach (examples include the phenology workshop and the education and outreach webinar series already on the 2016 calendar). iDigBio is also reaching out broadly to scientific communities by hosting seminars and workshops and giving presentations at professional society meetings. iDigBio participated in 20 meetings in 2015 (such as ESA, ASM, ASIH, and Botany to name a few), and has plans to increase the effort in 2016. Invite us to the meeting of your favorite society! Stay up-to-date with iDigBio in 2016 by visiting http://idigbio.org. When visiting the website, be sure to monitor the constantly evolving Wiki for content specific to digitization and collections, read press releases for ADBC-related news, and view reports for summaries of past events and publications related to the iDigBio community. Visit the iDigBio Calendar to view the upcoming workshops, webinars, and other iDigBio-related events coming in 2016. Stay connected with iDigBio by “liking” the project’s Facebook page, following iDigBio on Twitter, and joining the e-newsletter. Anyone can join the conversation in one of the many topic-based working groups or listservs provided by iDigBio. Thank you to all who contributed data to the portal, collaborated in a TCN, and/or participated in one of our events and webinars in 2015. iDigBio hopes everyone continues to be engaged and has a fantastic and productive 2016!